Stuck in the common 8-12-rep training rut? Break out by putting a little more weight on the bar and implementing some 5x5s. You’ll never hear us at M&F say there’s anything inherently wrong with doing sets in the 8-12-rep range. Most people agree that sets of 8-12 are your best bet for muscle size gains, not to mention it seems to put you in that happy medium of load – not too heavy, not too light. You can add size doing sets of 8-12, but you can also get stronger and burn body fat. But people (bodybuilding types especially) tend to get stuck in the 8-12 reps rut, where for a period of many months, or even years, the workout log looks something like this: 3 sets x 10 reps… 4x8… 3x8-10… 4x10-12… 3x12… 3x8… 3-4x8-12… and so on, over and over and over. 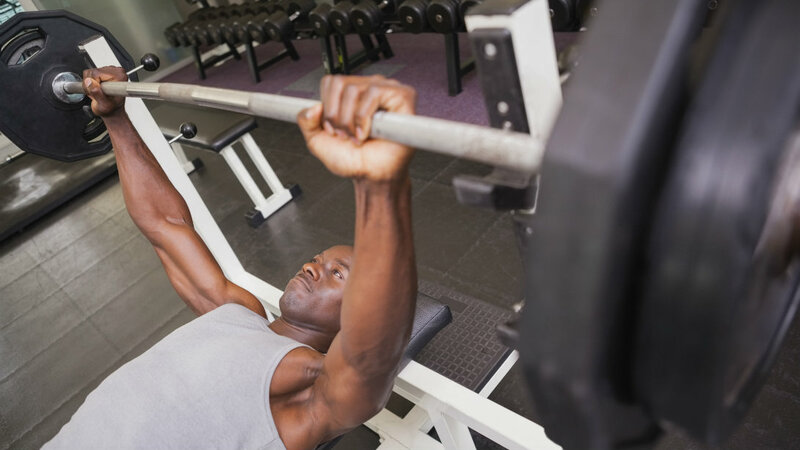 A heavy set is eight reps, a light set is 12 reps, and that’s the extent of it. Get stuck in such a rut and your results are bound to level off, to plateau. At this point, it’s about time to switch things up. If you’re like me, you’re not a fan of high reps – sets of 15, 20+ – so the only other option for changing things up from a rep-count standpoint is to decrease reps, which naturally means you’ll have to go a little heavier than you’re used to with 8-12 reps. When my routine starts to get a little stale, one thing I love doing is working in heavy sets. Not necessarily sets of one, two or three reps (I’m not a powerlifter), but rather sets of five and six reps. Going heavy like this, I feel, gives the body a different training stimulus to promote plateau-busting. Plus, I just like the way my muscles feel when they’ve handled some heavier weights – they feel stronger, of course, but also a bit harder, and I feel leaner, too. I like that. For me, it only makes sense to implement the traditional 5 sets of 5 reps in times like this. Legends like Reg Park (Arnold Schwarzenegger’s idol growing up) have sworn by 5x5. If I’m training, say, chest with 3-4 exercises, I typically won’t do all 3-4 exercises with five sets of five; more like the first exercise or two, then revert back to 8-12s for the last two. After all, changing things up doesn’t mean you have to completely overhaul every single exercise and set in your routine – just tweaking an exercise or two can do the trick.